Back in 1991, Eric Clapton suffered a loss no parent should ever face. The guitar legend’s 4-year-old son Conor fell from an open window on the 53rd floor of Galleria Condominiums in Manhattan. Conor Clapton was visiting a friend with his mother, Italian television actress Lori Del Santo. Dressed in red pajamas, Conor died instantly when he landed on the roof of an adjacent four-story building. Devastated, Eric Clapton isolated himself and avoided the spotlight. 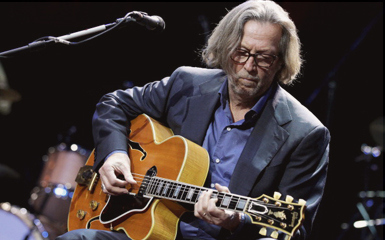 The next year, Eric Clapton reappeared with the passionate single “Tears in Heaven.” The personal lyrics were first heard on the soundtrack to Rush. Clapton then recorded a live version on his highly successful Unplugged album. “Tears in Heaven” reached Number 2 on the Billboard charts in the United States. Nominated for nine Grammy Awards, it took home a trophy for Song of the Year in 1993. It even earned an MTV Video Music Award for Best Male Video. Meanwhile, “Tears in Heaven” is ranked number 362 on Rolling Stone‘s list of “The 500 Greatest Songs of All Time.” Dad eventually made a number of public service announcements to educate parents on child-proofing windows in their homes. 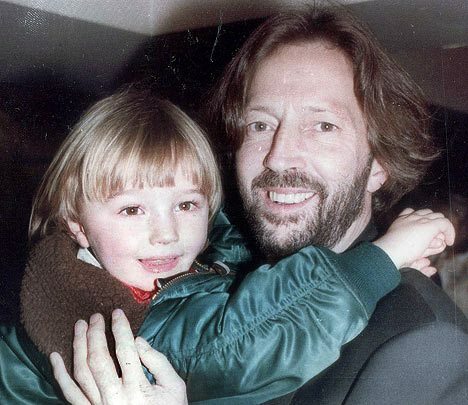 Released as a single in 1998, “My Father’s Eyes” deals with Clapton never meeting his Dad. The lyrics explain that the songwriter wishes he knew his Dad, who passed away in the eighties. “My Father’s Eyes” also refers to Conor’s death. “I tried to describe the parallel between looking in the eyes of my son, and the eyes of the father that I never met, through the chain of our blood,” he wrote in Clapton: The Autobiography. Clapton stopped performing both heartfelt numbers in 2004. After using music to help his healing journey, the founder of Cream and Derek and the Dominoes decided that playing the touching numbers was no longer necessary. Introducing the two songs from a much more detached point of view, “Tears in Heaven” and “My Father’s Eyes” were added to his set list for this year’s Old Sock tour. Eric Clapton’s 21st Studio album features some of his favorite covers, as well as exemplary guests, including Sir Paul McCartney and Steve Winwood. Old Sock reached Number 7 on the Billboard charts. Not every parent who goes through the devastating trauma of losing a child can write a top-selling single to deal with the pain. That is why Facing Death to Embrace Life is an optional component of leading marriage and relationship education programs. In a life-changing experience, Mothers and Fathers reflect on what the end of life means to them personally and speak words to each other that are often never spoken until it is too late. The experience gives participants a new appreciation for living and loving. Rather than being depressing, Moms and Dads learn to intentionally share their feelings with the people they love most and embrace the gift of each day, knowing we never know what tomorrow will bring.